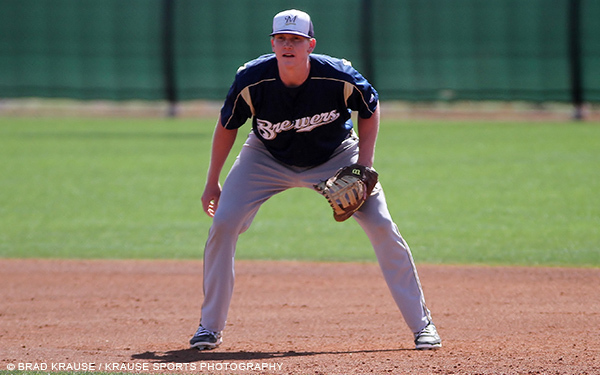 The Yankees have made their first trade of July 2017 with the acquisition of Garrett Cooper, a first baseman for the Colorado Springs Sky Sox, the Triple A affiliate of the Milwaukee Brewers. When I first heard that the Yankees had traded lefty reliever Tyler Webb to Milwaukee to acquire Cooper, I admit that I was skeptical. I have not been following the Brewers farm system nor did I watch this week's Triple A All-Star Game. If I had, I would have realized that the Yankees have acquired a promising first baseman which happens to be a great need. Cooper was named the Pacific Coast League Player of the Week for the week ending July 9th. He was also the starting first baseman for the PCL in the Triple A All-Star Game yesterday. He has steadily progressed through the ranks. He was taken in the 6th round of the 2013 MLB Draft by the Brewers, and is considered a "late bloomer" in the midst of a breakout year. Cooper is currently hitting .366 with 17 HR and 82 RBI in 75 games for the Sky Sox. There's not much doubt he'll soon be the latest Baby Bomber in Pinstripes even if he has never played a game for the organization. He's 26 and is a "big boy" (6'6", 230 lbs). He has benefited from the altitude of Colorado Springs and playing in a hitters' league but why not roll the dice. After watching the Chicago Cubs send their top prospect, outfielder Eloy Jimenez, the #5 prospect in the MLB according to Baseball America's midseason update, and other prospects to the Chicago White Sox for starting pitcher Jose Quintana, it's clear that the cost of pitching is astronomical (as if we didn't know that already). There's no way I would have signed off on a deal to send Gleyber Torres or even Clint Frazier to the White Sox for Quintana. Let the Cubs fork over the farm. This reinforces that the Yankees should stay the course and continue to build for the next few years and avoid the "quick fix" for the Wild Card. So, I am okay with the under-the-radar moves that do not cost high-ranking prospects. I hated to see Webb go as I've liked the pitcher and I was excited that he finally had his opportunity at the big league level. I felt that he performed well in his few appearances for the Yankees. He obviously was not one of Joe Girardi's "go to" guys in the pen but he played a valuable support role. I guess all things considered, this was a modest cost for a guy who has torn apart Triple A pitching. How that translates to the Major Leagues only time will tell. But if my name was Ji-Man Choi, I'd probably be packing my bags. Yanks will want to see how Cooper performs in the International League before making his MLB debut but the guy with the similar name to the actor who played Lou Gehrig in The Pride of the Yankees is on his way. If he fields his position, knocks in a few runs, and doesn't kill rallies by hitting into double plays, he'll be better than anything we've seen yet at first base. Cooper has been assigned to Scranton/Wilkes-Barre. Welcome to the Yankees, Garrett!